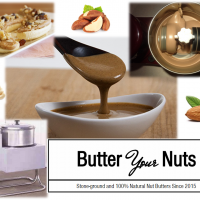 We are a micro stone-ground natural nut butter company located in Cleveland, OH. We produce all natural, stone-ground nut butters that are free of preservatives, oils, stabilizers, and unnecessary ingredients, Only the best goes in so only the best comes out! How would you use the grant money? We would use the grant money towards the purchase of new equipment to increase our production capacity. Our production capacity is very limited with our small stone nut grinder and a new larger one costs $7000. Currently with our small grinder, we can produce 6-9 jars in 3hrs. The new grinder will allow us to increase production to 75-90 jars in 3hrs. Getting this new grinder will be vital in reducing our operating expenses while meeting the huge demand for our nut butters. What would the grant enable you to do that you can't now? It will increase our production capacity 10x while driving our operating costs down since we operate in a shared commercial kitchen space and pay per hour of use. With the increased production capacity it will optimize our time in the kitchen. We have a huge wholesale demand that we have been limiting due to the production capacity limitations that we have. If Idea Cafe's Grant helps your biz reach greater success, how will you "pay it forward" to help others in some way? We believe in social responsibility. Being a successful and profitable business, it will allow us to give back to our local community to help the homeless and raise awareness for mental health.